Western Province Deputy Permanent Secretary Bernard Chomba (l) congratulates Mongu Mayor Akayombokwa Kusiyo (r) shortly after handing over a truck to Mongu Municipal Council for garbage collection at a total cost of k784, 200.80 in Mongu, Western Province. Government has procured a tipper truck worthy K784, 000 for the Mongu Municipal Council. 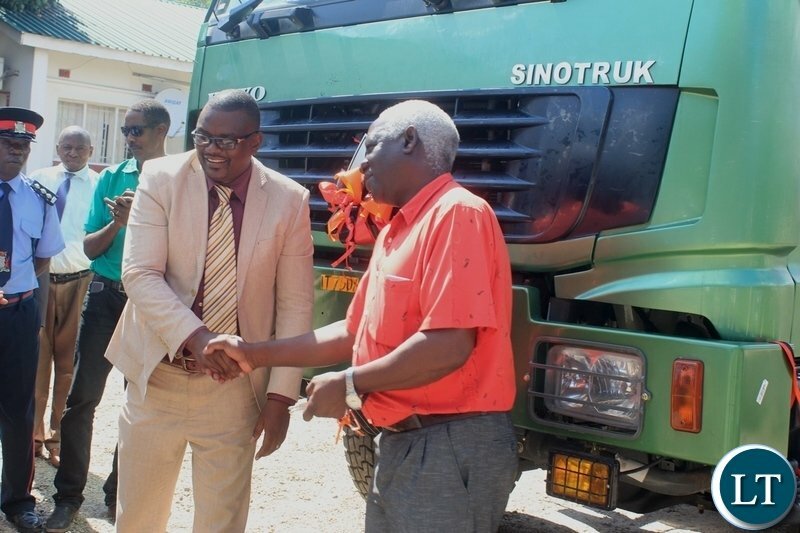 Speaking during the handover of the truck at provincial administration in Mongu today, Acting Western Province Permanent Secretary Bernard Chomba urged the local authority to fully utilize the truck to ensure high levels of cleanliness in the district. Mr. Chomba stated that it is important to ensure that all the public places and homes are kept clean to avoid outbreak of diseases such as cholera. And Mongu Mayor Kusiyo Akayombokwa thanked government for supporting the local authority to improve its service delivery systems. Mr. Akayombokwa said the truck will go a long way in helping the Council maintain roads and cleanliness in the townships. He implored residents to work with the local authority and ensure high levels of cleanliness in the district. The vehicle is meant to enforce the Make Zambia, Clean, Green and Health campaign in Mongu district which was re-launched by President Edgar Lungu in April this year. 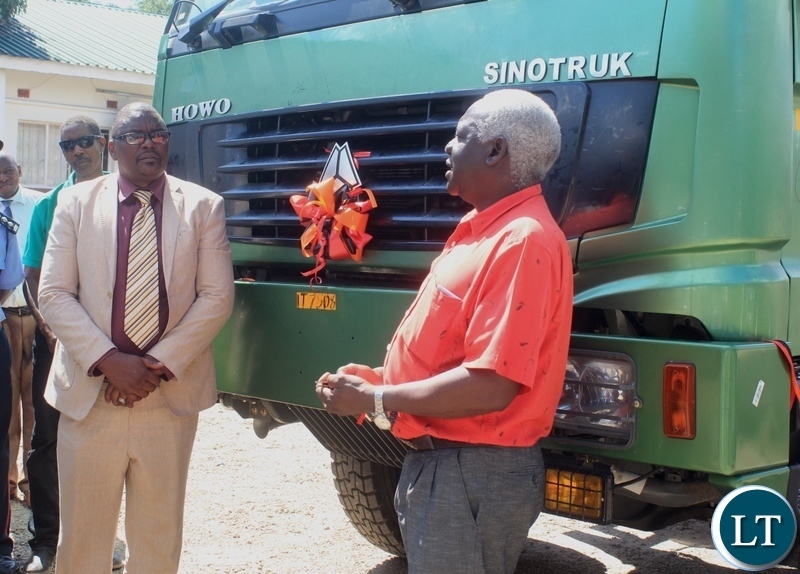 Mongu Mayor Akayombokwa Kusiyo (r) interacts with Western Province Deputy Permanent Secretary Bernard Chomba (l) shortly after handing over a truck to Mongu Municipal Council for garbage collection at a total cost of k784, 200.80 in Mongu, Western Province. 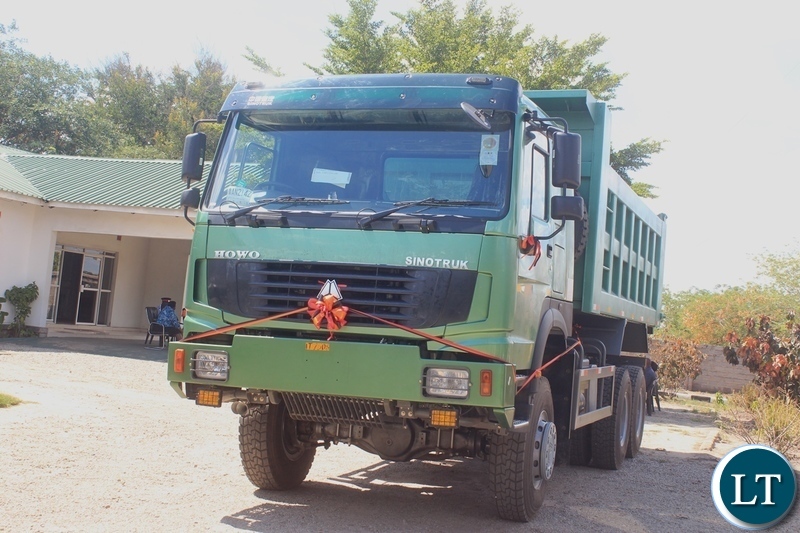 A truck that has been handed over to Mongu Municipal Council for garbage collection by Western Provincial Administration at a total cost of k784,200.80 in Mongu, Western Province. Zambian leaders you really disgust me, how do you even call reporters to show that you have bought a tipper truck!!!?? That’s just your normal job, its like you buy a bin in the house and you expect an applaud from you children and wife!!! You must be ashamed of you selves for buying the tipper so late. I even wonder if the are bins in mongu town!! You will see the DC for Mongu writing to minster of local government that he wants to start using it as personal vehicle. Another wheelbarrow….lol. Still HOWO SINOTRUK. This is laughable. How can this be news, honestly? We must be a small economy like a young child who has just been bought a toy. They are busy buying VVIP aircraft for $400million when these rural towns or districts dont even have proper refuse trucks!! Let’s develop this thing! It is UNELECTABLE! HAZALUZA HAGAIN. Where are you going to get parts for that thing in Lusaka from Mongu…doesnt make economical sense procuring Chinese rubbish!! Seriously. Is this news? Purchasing one tipper truck for a municipal council? Buying a ripper truck for a council in zambia is national news? Just like the time they exported honey. Next even filling a pothole on the road will require an official opening. Honestly, is this news, might as well call the media when a mongu resident buys a car and decides to make it a taxicab. This is truly sad.